The Japan Self-Defense Force ship JS Shirane (DDH 143) is the lead ship of the Shirane Class helicopter destroyers. Image courtesy of photographer PO1 Takahiro Ito, Japan Maritime Self-Defense Force. 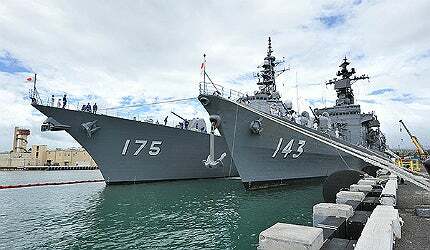 The JMSDF destroyer JS Shirane (DDH 143) along with JS Myoko (DDG 175) moored at Joint Base Pearl Harbour Hickam. Image courtesy of LS Tetsuya Sekino, Japan Maritime Self-Defense Force. The Japan Self-Defense Force destroyer JS Shirane (DDH 143) transits the waters of Joint Base Pearl Harbour-Hickam during the biennial Rim of the Pacific (RIMPAC) exercise. Image courtesy of Mass Communication Specialist 2nd Class Daniel Barker, US Navy. A long side view of the Japan Maritime Self-Defence Force destroyer JS Kurama (DDH 144) during a formation in the East China Sea. Image courtesy of Lt. Cmdr. Denver Applehans, US Navy. The Japan Maritime Self-Defense Force destroyer JS Shirane (DDH 143) participates in the Parade of Sail launching Fleet Week New York 2012. Image courtesy of Mass Communication Specialist 1st Class Elisandro T. Diaz, US Navy. "Shirane Class destroyers are capable of conducting ASW, anti-surface warfare (ASUW) and anti-air warfare (AAW) missions." Shirane Class destroyers are capable of conducting anti-submarine warfare (ASW), anti-surface warfare (ASUW) and anti-air warfare (AAW) missions. The keel for the lead ship in class, Shirane (DDH 143), was laid down in February 1977. The destroyer was launched in September 1978 and commissioned in March 1980. The second and last ship in class, Kurama (DDH 144), was laid in February 1978 and launched in September 1979. The ship was commissioned into the JMSDF in March 1981. Yokosuka is the homeport for Shirane, whereas Kurama is based in Sasebo. On 27 October 2009, the Kurama collided with a Korean container ship in the Kanmon Strait near the island of Kyushu during its return to homeport Sasebo after participating in a fleet review at the Yokosuka Naval Base. The collision caused substantial damage to the bow section of the ship. The Shirane Class incorporates an improved design based on the Haruna Class destroyers. Shirane is slightly larger than its predecessor. It is the first Japanese combat ship to be equipped with a three dimensional radar. The ship has an overall length of 159m, beam of 17.5m and draught of 5.3m. The standard and full load displacements of the ship are 5,200t and 6,800t respectively. Shirane can complement a crew of 350. Shirane Class destroyers are fitted with a single octuple launcher for firing RIM-7 Sea Sparrow surface-to-air missiles. "The Shirane Class incorporates an improved design based on the Haruna Class destroyers." The Sea Sparrow missile protects the ships from high-speed aircraft and sea-skimming missiles. The missile can carry an annular blast fragmentation warhead for an operational range of 19km. The main guns fitted forward are two Mk-42 127mm/54cal rapid fire guns. The Mk-42 can fire at a maximum rate of 40 rounds a minute for a range of 23km. The close-point defence is provided by two 20-mm Phalanx close-in weapon systems (CIWS). It has a rate of fire of 3,000 to 4,500 rounds a minute. Phalanx can defend incoming anti-ship missiles, helicopters and high-speed surface vessels. The anti-submarine warfare is supported by ASROCs (Anti-Submarine ROCkets) and torpedoes. The Mk-16 octuple launcher fitted on the vessel can fire RUR-5 ASROC against hostile submarines. The ship is fitted with Mk 32 triple torpedo tubes for firing Mk-46 lightweight ASW torpedoes. The Mk 46 torpedoes can engage submarines operating within the depth of more than 365m. The Murasame Class guided-missile destroyers are third-generation multi-purpose ships of the Japan Maritime Self Defence Force (JMSDF). The sensors suite includes a three dimensional radar, a surface-search radar, a navigation radar, two Type 72 gun control systems and a missile control radar. The destroyer is also equipped with hull-mounted sonar, variable depth sonar (VDS), passive towed-array sonar and an electronic support measures (ESM) system. Shirane Class has a large helicopter deck at the stern side of the ship for supporting the operations of three SH-60J/K helicopters. The helicopters are equipped to conduct anti-submarine warfare and patrol missions. The embarked helicopters are stored in a hangar facility located amidships. The vessels feature the Bear Trap haul-down system for landing helicopters in harsh weather conditions. The propulsion system integrates two IHI boilers, two steam turbines and two shafts. The two sets of geared turbines deliver 70,000shp to shafts. The propulsion system provides a maximum speed of 32kt. The ships are fitted with Masker radiated noise reduction system to cut down the underwater noise generated from the main propulsion machinery. The system creates an uninterrupted layer of minute air bubbles on the hull under the machinery places. The layer of bubbles serves as a sound-muting bed.